The Crème Caramel is, I think, one of the most iconic French dessert, one that you’ll find on every brasserie menu around France or French restaurants overseas. It is a dessert I used to have growing up; even the school cantine used to serve crème caramel. I like to refer to this dessert as the Tarte Tatin version of the Crème Brulée because it has the caramel at the bottom while cooking. I decided to revisit this classic recipe and give it my own personal twist by adding some saffron and orange blossom aroma. The floral aroma and the richness of the saffron combined with the refreshing scent of the orange blossom goes perfectly with the sweetness of the caramel. 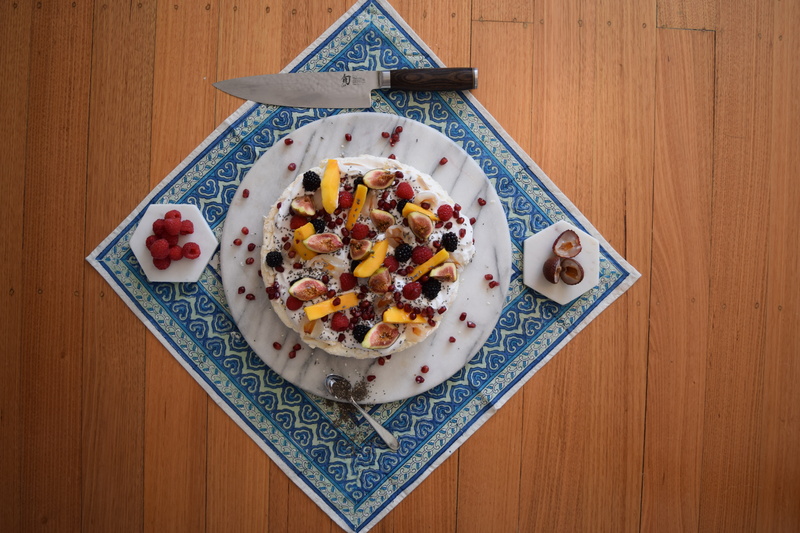 It also adds a touch of spring to this classic French dessert! Mix the sugar and water together in saucepan and cook until the sugar becomes golden in colour. Then pour the caramel at the bottom of deep round baking dish, preferably glass or ceramic, and leave to set. Preheat the oven at 180 degrees Celsius and boil the kettle for the bain-marie. Bring the milk, saffron and orange blossom to the boil and leave to infuse for 10 minutes. In the meantime, whisk the egg and sugar together until slightly white and foamy. Pour the hot milk over the eggs through a strainer, and whisk until all the ingredients are dissolved. Pour the mixture over the caramel, place the dish in a deep tray and cook in the bain-marie for 25-30 minutes. Let the crème caramel cool in the dish before you take it out as it may collapse if you do it when it’s still hot. To unmold the crème, gently run a small knife around the edge of the dish. 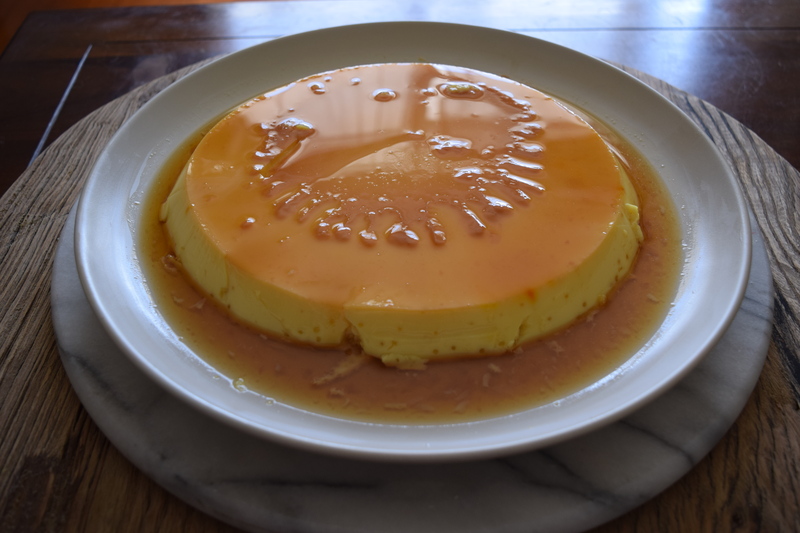 Then place a serving plate slightly bigger than the baking dish over the crème caramel upside down and quickly flip it around while holding both plate. Reserve in the fridge until you’re ready to serve it. Watch the how to video below or visit my YouTube channel here for more! Superfoods and raw foods may be the culinary trends du jour, but there’s still something about a decadent chocolate dessert that can tip most diet-devotees of the wagon, if only for an indulgent moment. This is one such dessert. You know the kind: almost too pretty to be eaten, seemingly rich, but wonderfully light at the same time. Transporting, satiating, moreish. Drooling yet? Stop reading, and start baking! Boil the milk, mascarpone and the instant coffee. Whisk the yolk and sugar together until slightly white. Pour the boiled milk over the eggs in two times while whisking non stop! Cook the mix over medium heat until it reaches 83 degrees Celsius, just like a crème anglaise. Place the chocolate in an electric mixer bowl and pour the hot mix over it while whisking. Whisk until the chocolate is completely melted. Transfer the mix into a clean recipient and wrap it with cling film, making sure it’s in direct contact, and place in the fridge until the next day. Whisk the egg white in an electric mixer until they become slightly firm, then start adding the sugar. Whisk for about 3-4 minutes to obtain a nice meringue. Gently fold in the icing sugar and hazelnut powder using a rubber spatula. Then gently add the flour to the meringue. Spread the mix on a flat baking tray lined with baking paper, about 1cm thickness, and bake for 6 minutes. 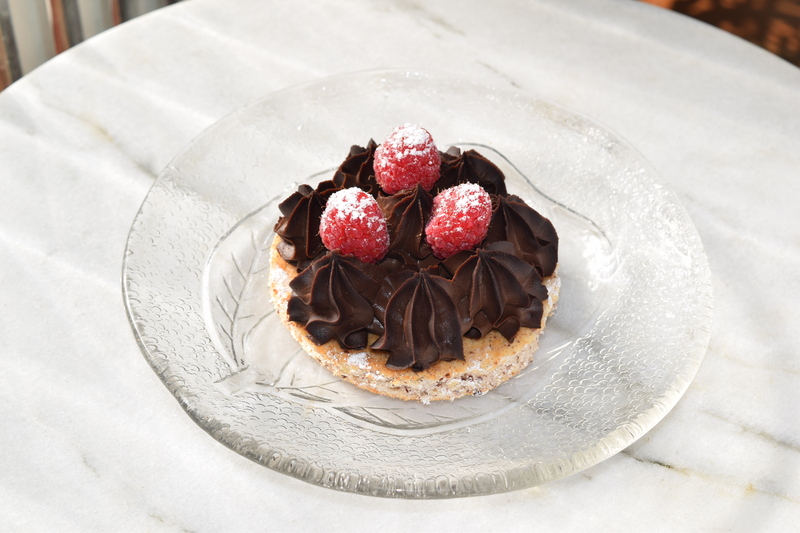 Cut the Dacquoise using a round cookie cutter, the size you use is up to you! Pipe the crémeux on the biscuit using a pipping bag with a star nozzle and garnish with fresh raspberries. The richness of the crémeux, the nuttiness of the biscuit and the acidity of the raspberries create, I think, a well balanced dessert!